What do you think of when I say “Facebook marketing”? You are probably thinking “coupons”, “promotions”, “product launch”, or even “contests”. Brands are well aware of the interest of the largest social network and its functions for promoting and creating an enthusiastic following. But Facebook is not only the El Dorado for “commercial” brands, it is also an ideal marketing tool for humanitarian and charitable organizations. 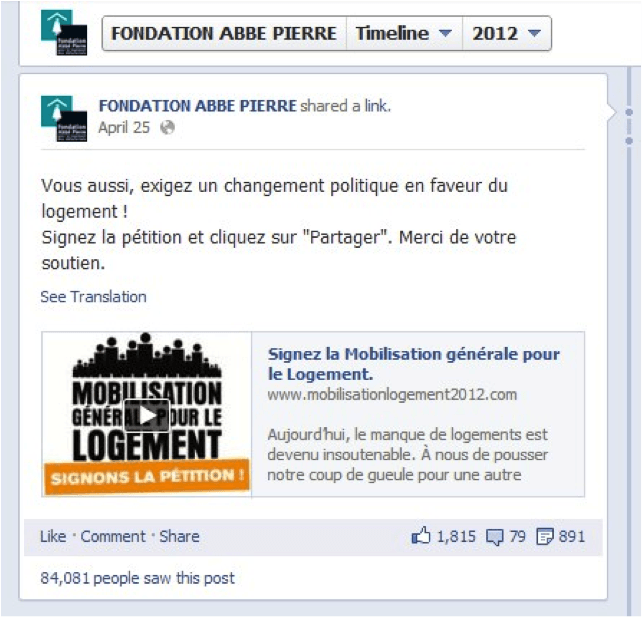 To illustrate this point and avoid using overheard generalities, I would like to describe in detail a Facebook campaign I ran several months ago for one of the most well-known French humanitarian organizations: The Abbé Pierre Foundation. This foundation was established by the French priest Abbé Pierre 30 years ago to fight for the improvement of the housing conditions among the poor. 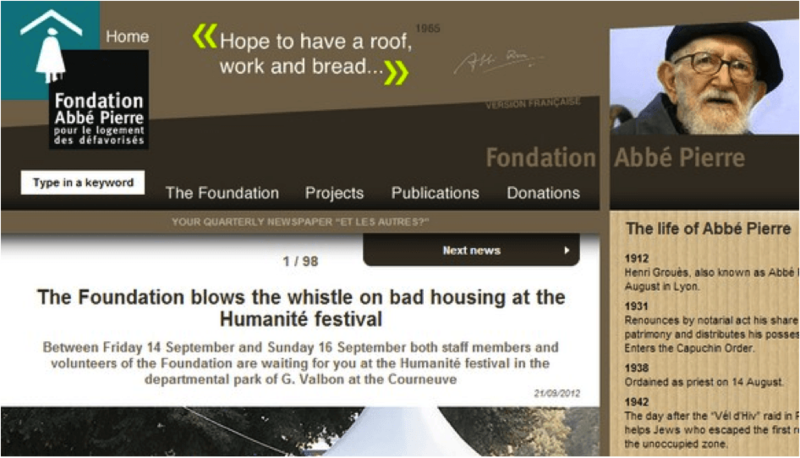 The Abbé Pierre Foundation is a charitable organization that works to improve poor housing conditions in France. The founder, who died several years ago, was a beloved personality in France during his time, but was less known among the younger generations. The same Foundation that was so popular for over 40 years suffered from a lack of visibility among those less than 30 years of age. Every year, as winter approaches, the Foundation launches a large publicity campaign. Its objective is to increase public awareness about the Foundation’s activities in fighting inadequate housing as well as to attract the attention of politicians and generate donations. Usually, these publicity campaigns occur in traditional media outlets such as newspapers, billboards, and large events. But during the winter campaign of 2011, the Foundation realized the importance of social media and Facebook in particular. They decided it was time to give this outlet a try. As in preceding years, the plan was to generate as much visibility as possible to achieve the goals of raising awareness of the fight against inadequate housing, generate public support to influence politicians, and connect with the younger generation. The measures of success, as defined by the executives of the Foundation, were the number of signatures of its petition against inadequate housing and the number of people the message reached. A large part of the budget was still committed to traditional media outlets, but the portion allocated to Facebook was still significant for a non-profit organization: $90,000 with $65,000 going to Facebook ads. The first component was to socialize the petition signatures by exploiting the viral potential of Facebook. To do this, we utilized the Agorapulse Facebook petition application which easily allows each signatory to invite their friends to sign and, more importantly, automatically share signatures with all their friends thanks to Open Graph frictionless sharing. The Facebook petition application asks users to become a fan of the page, sign the petition, and then conveniently invite friends to sign. The second component was a little more creative: we developed a Flash module that would allow the signature of the petition directly in the newsfeed of the Foundation’s Facebook page, as well as in those of their partners! 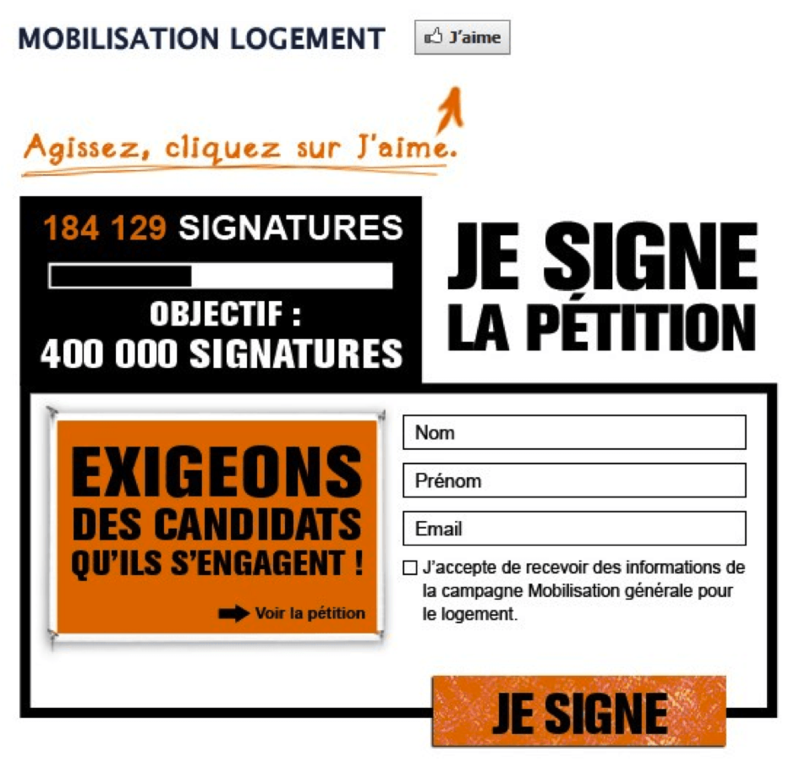 To achieve this, the Flash application we developed uses the design of the petition, including signature and information fields (first name, last name, and email), then inserted code that would automatically feed the data entered by signatories into the global petition database. 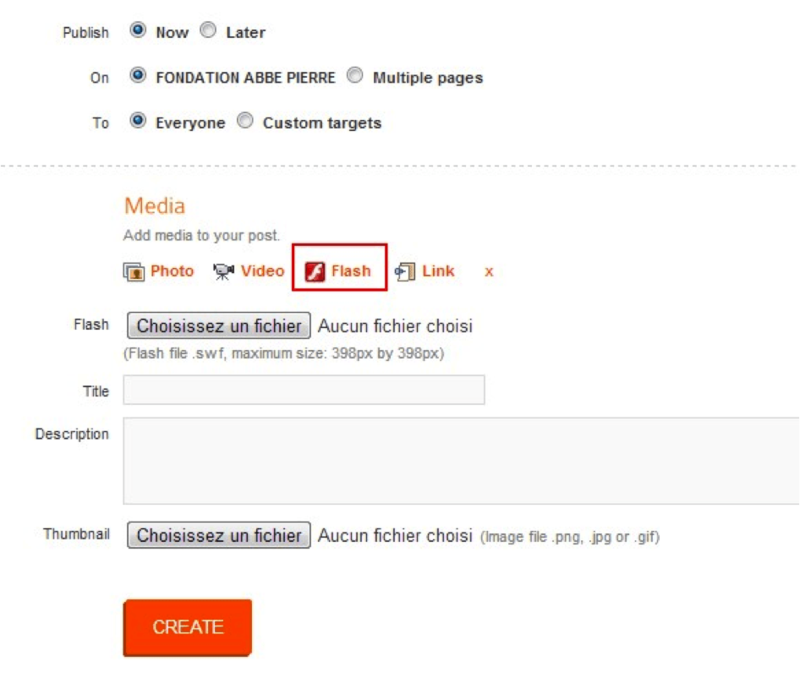 The signature module in Flash had an optimized display in the page’s newsfeed with a very clear call to action and the ability to easily share a signature. This specific post of the module had more than 891 shares and 1,815 likes! If we consider that each fan who liked or shared this signature module had an average of 130 friends, the virality of the operation was significant. Once the post was clicked, the signature module was immediately displayed without having to leave the newsfeed. The development of this Flash application cost around €500, which is a reasonable price considering the results described below. For those of you interested on a technical level, I have made the Flash file that we used available here. You also have the option of having the gathered data from this application automatically sent to MailChimp for sending emails later. To do so, you can use this Flash file containing all the necessary code. Special thanks to John Koht for making the file available to us. Next, you have to use a third-party app with the option to post the Flash signature module to the Facebook page’s newsfeed. Posting Flash files directly through Facebook is not possible. Fortunately, some applications like Agorapulse can do it for a reasonable monthly rate. This is a screenshot of the publishing interface of the platform. The results achieved were even better than we hoped. Foremost, the viral effect of the Facebook signature application was incredibly powerful. On average, two out of six friends invited by the original signatory ended up signing the petition. Some of the most active garnered more than 150 friends’ signatures. The Agorapulse’s petition application makes it very easy to invite friends to sign. This screen shows the top 6 signees that inspired the most friends to sign as well. The top one getting 167 friends to sign! But the most effective was, without a doubt, the Flash signature module inserted into the page’s newsfeed and into the pages of partners and supporters. The primary advantage of this tactic is that each signature obtained did not cost a cent. 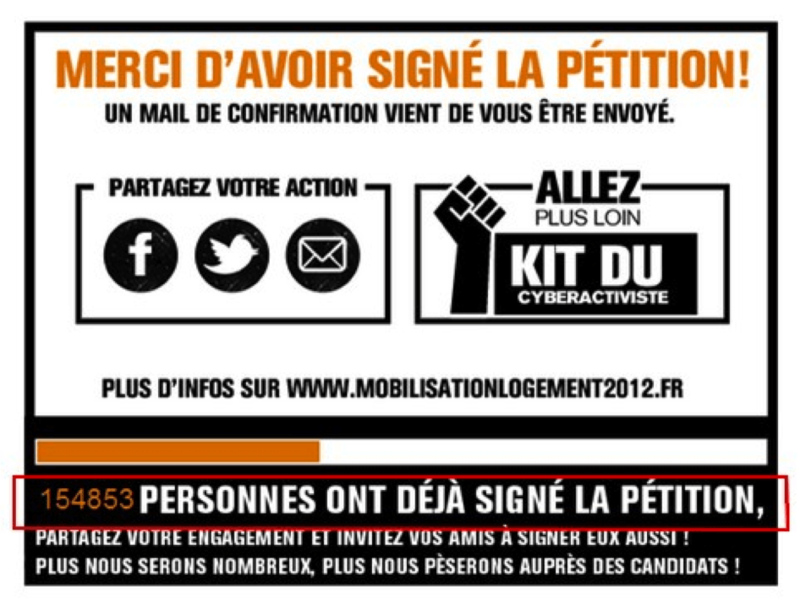 Even if the petition application functioned well, you still had to spend money on Facebook ads to attract signatories. The Flash signature module, however, was displayed in the newsfeed of the Foundation’s Facebook page without any additional cost. And when you have a significant fan base, signatures are obtained for free. The advantages did not stop there. 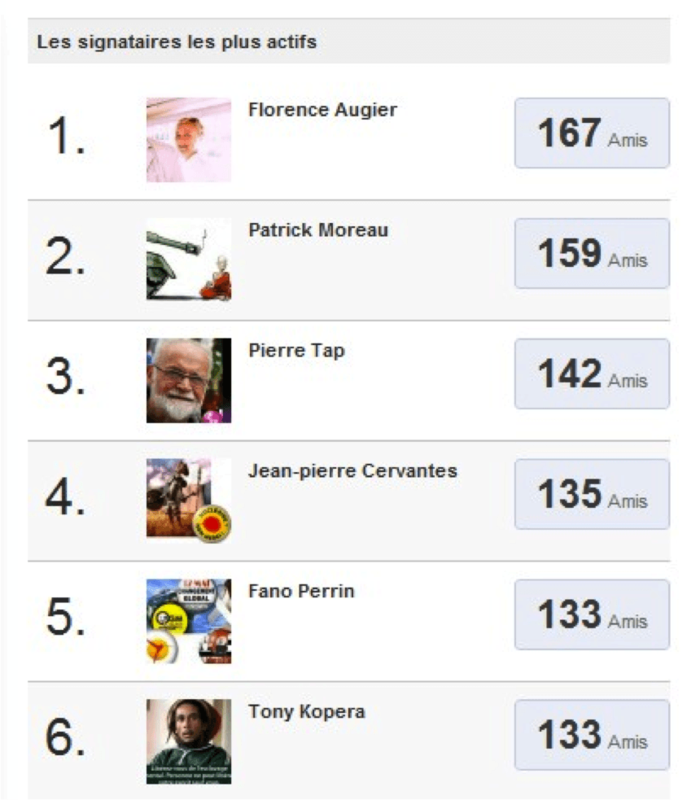 The Foundation enjoys strong support among the French celebrities who have large fan bases of their own on Facebook. These fans could be converted to signatories when the celebrities displayed the module on their own page. Ultimately, this means thousands of additional signatures without spending a dime. Meanwhile, the cost of a signature garnered through traditional media was about €1 each. In the end, the petition gathered more than 155,000 signatures, virtually half of which were attributed to Facebook. These results were achieved despite the fact that less than half of the budget was allocated to Facebook marketing. In total, there were almost 155,000 people who signed the petition. Facebook was the source of nearly half the signatures. And that’s not all. By being on Facebook, the Foundation has a reliable, active, and identifiable fan base — over and above a collection of signatures. If obtaining more than 150,000 signatures was the primary goal set by the directors of the Foundation and achieved via Facebook, then discovering other significant long-term benefits was a nice surprise. The first of these benefits was the fact that the Foundation was able to recruit more than 200,000 fans. They had none before this campaign. If this figure is not valuable by itself, the visibility attained with the fan base for the Foundation’s activities represents considerable value. On average, each post by the Foundation reached about 24% of its fans – 50,000 people – at a rate of 4 to 5 times per week. With the Agorapulse Barometer, we were able to determine that each post on the Foundation’s Facebook page reached, on average, 23.5% of its fans, more than 50,000 people. The top 1,000 fans liked at least 35 of the Foundation’s posts, the top 100 fans liked at least 200. The top 100 fans commented on at least 20 posts, the top 5 fans each commented at least 100 times. Wow! 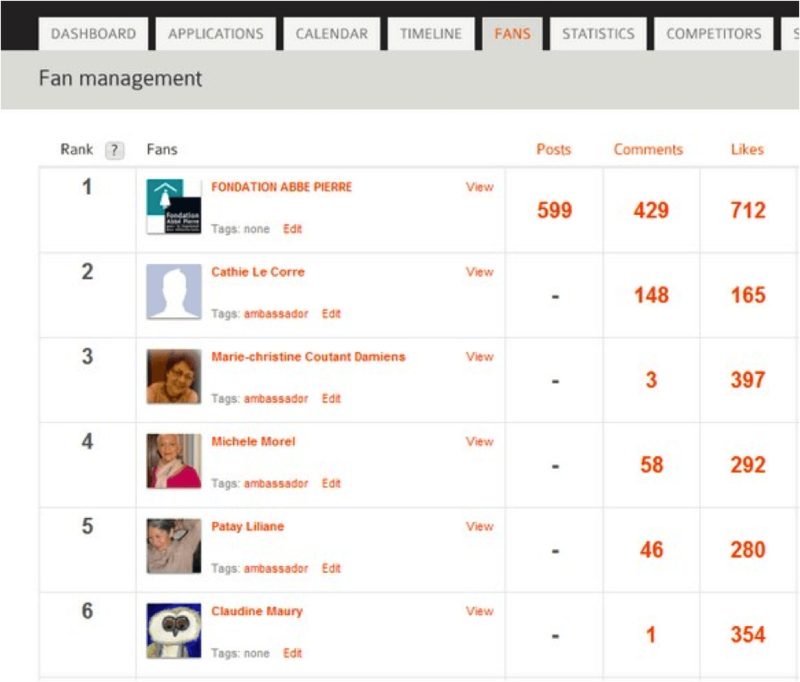 The Agorapulse fan management module highlighted the most active fans according to their level of activity on the page. The most active fans liked up to 400 page posts. A list of the most active fans, and therefore the best potential ambassadors for the organization’s activities, can be compiled in seconds. Ones you know who these active fans are, you won’t need to do much to transform these motivated fans into generous donors! Also, as tens of thousands of them have provided their email addresses and agreed to be contacted via the petition application, it’s easier than ever to establish a special contact with these “super-fans”. 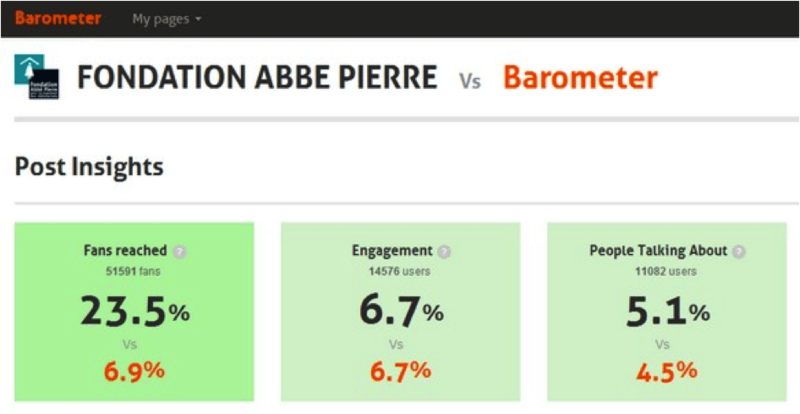 Let’s check the results of this operation in concluding this article: In less than a year, the Abbé Pierre Foundation went from having no Facebook presence at all to becoming a major player in its sector on the social network. I hope that this case study has given you some new ideas for your own organization or brand.